K&N air filters should be periodically soaked in K&N cleaner and re-oiled to maintain their peak performance and operation levels. 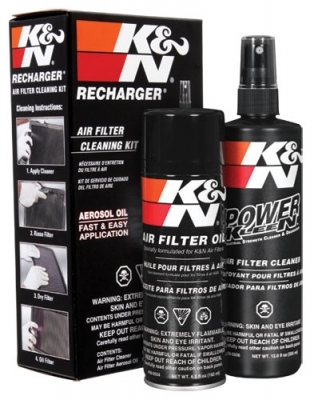 The K&N Recharger Air Filter Cleaning Kit contains an air filter cleaner and oiling kit for recharging any K&N air filter. Designed to restore air flow and efficiency so your filter performs like new. Each kit includes a 12 oz bottle of filter cleaner and a 8 oz squeeze bottle of filter oil. Maintain the efficiency of your premium air filter with this recharge kit from K&N. 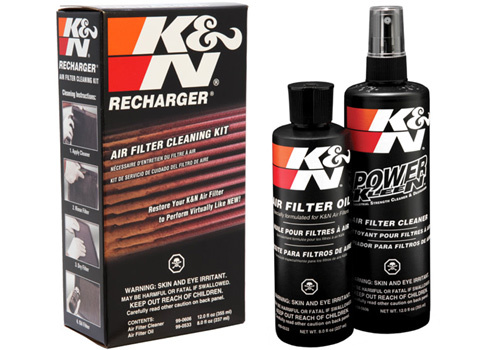 Simply clean and re-oil your existing K&N Filter with this convenient and easy to use kit.